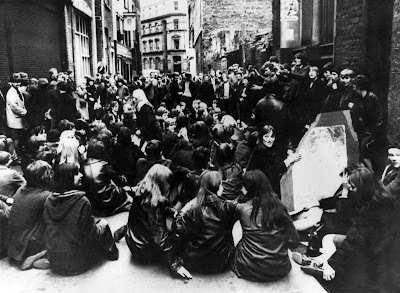 In late 1965 it was announced that unless the owner of the Cavern Club, Ray McFall, was able to pay for some updates that were mandated by the city, the Cavern Club would have to close it's doors. Fans talked to Paul McCartney about it and everyone tried to raise the funds, but it didn't happen. So in February 1966, the fans decided to hold a sit in to protest the demolition of the Cavern Club. It didn't work, but they sure gave it their best!